The main reason you shouldn’t delay repairing a roof problem is simply that you don’t want the issue to get worse. What may look like a small water spot on your ceiling could get much, much larger in just a matter of days. What many homeowners fail to realize is that roof problems are rarely limited to just the roof. Moisture damage from a poor performing roof can cause water to penetrate and seep into the walls, damaging the siding on both the outside and inside of your walls. Water can also damage your home’s insulation and electrical systems, posing structural issues and fire hazards. Some home insurance policies cover the cost of a roof repair or replacement…if homeowners catch the issue early. If the problem has persisted for some time and is not reported to your insurance agency in a timely manner, it can technically be considered neglect. In these cases, your insurance company can reject your claims. You’d be surprised at how many homeowners fail to realize that those seemingly small roof leaks can lead to major health concerns. After all, warm, damp environments can be the perfect breeding conditions for mold, algae, bacteria and insects. These can all pose health hazards to anyone under your roof, but they can be prevented just by paying more attention to your roof’s health. Do you need help with a roofing problem? State Roofing’s team of roof repair specialists will be more than happy to help. 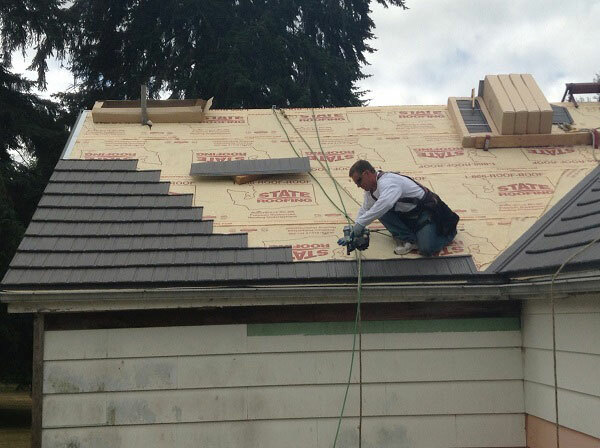 We’re the leading provider of roofing products and services in Seattle, Tacoma, Bothell and Everett, WA. Call us at (360) 205-3100 or fill out our contact form to request a free quote.